As a member of the Gauselmann Group based in Germany, Merkur Gaming has become a trendsetter as well as one of the most important companies of the gaming industry. Merkur is known worldwide to be a symbol of experience, entertainment and innovation. 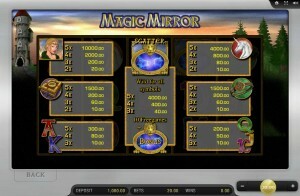 A fabulous, new slot launched by Merkur is the fantasy game called the Magic Mirror. What makes the slot game so spectacular is its great prizes and outstanding features and graphics. Its mystical graphics in high definition quality are magnificent and match with the sound effects perfectly. Its awesome animations and engrossing audio will leave you mesmerized by its world of fantasy. 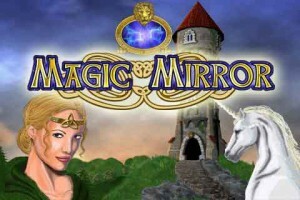 Let’s take a close-up look at what this game has to offer a person by looking into the Magic Mirror. Wouldn’t you love a captivating fantasy story that takes you into enchanted forests and mystical oceans in a quest for the treasures of an unknown land? I certainly would. How about adding tragic heroes and magical worlds with dwarves, trolls, elves and monsters. When you travel into the beautiful and magical world of the Magic Mirror, these images are portrayed as the symbols of the game creating its mystifying theme. The low value symbols of the game are those based on playing cards including A, J, K, Q, and 10. The fantasy theme related symbols are high valued and include a graceful unicorn, a book of spells, a magical ring, a female who looks like a sorceress, eleven princesses and mirrors. Whenever one of the theme related symbols are included in a win, they are amusingly animated. 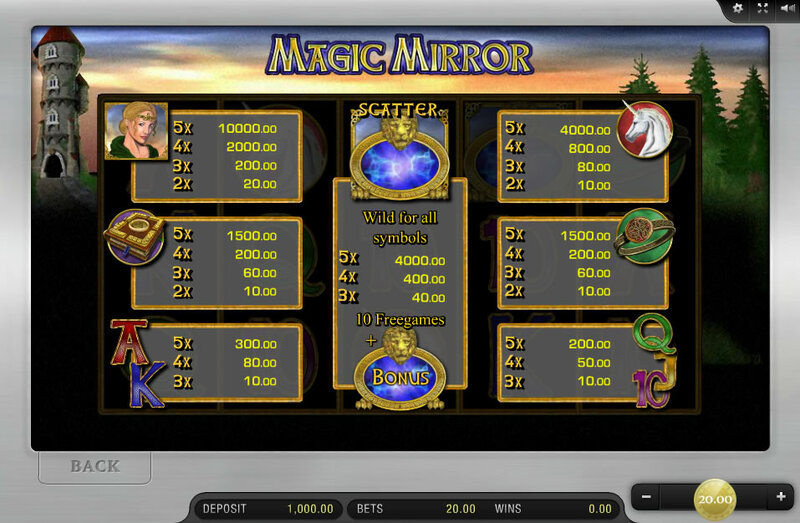 The special symbols of the game are both portrayed as mirrors. The two special symbols are: The “Scatter & Wild” Mirror: This symbol can substitute for any of the other symbols. If your spin has at least three of these, you will be awarded extra coins. 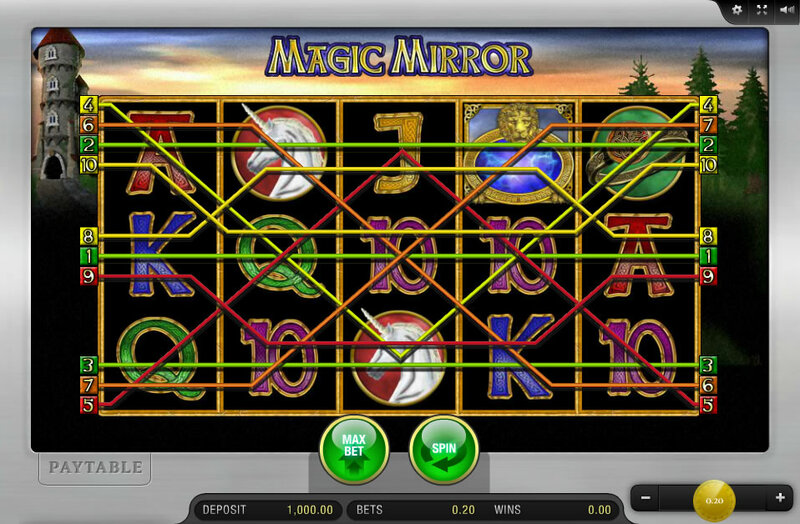 The “Bonus Mirror”: Three of these triggers 10 free games. Like most slot games, this game has five reels and ten paylines. The widely familiar goal of a win is to get three matching symbols across one of the 10 paylines. Bets can be placed on each of the ten fixed paylines, however, a player can change the amount of the bet when they play each round. This is done by selecting the plus and minus buttons found next to the amount. The minimum amount of a bet is $0.10 and the maximum amount is $20. The Magic Mirror is especially magical since it can be both the scatter and the wild. When it acts as the wild, it substitutes for any symbol needed to complete a winning combination. By being the scatter, you are rewarded with ten free spins if you manage to get 3, 4 or 5 of them with a spin. 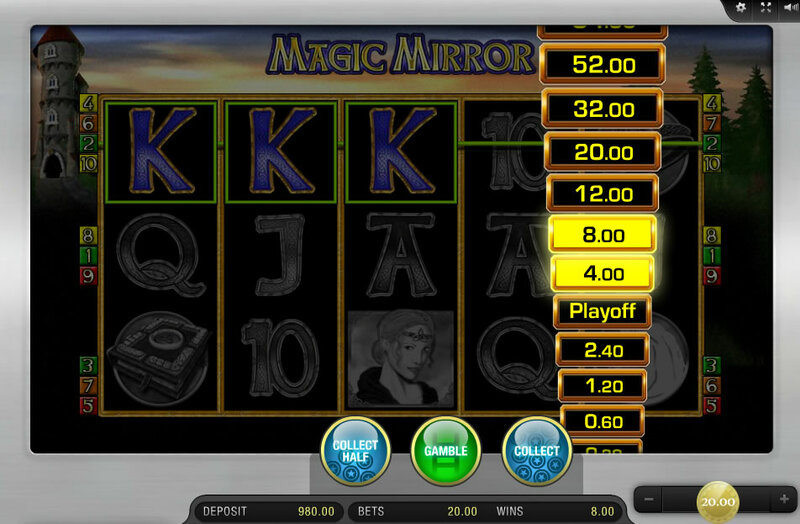 Magic Mirror scatter symbols don’t have to be on the same line, but can appear scattered anywhere on the screen. During the round of ten free spins, magic is the key to a special symbol. This is because at the start of the free round any one of the symbols randomly becomes the special symbol. By getting enough of this symbol for a win, the symbol is magically spread on each of the reels that it is seen on giving you a great big cash prize. Card Game – If you guess whether the color or the next card to be turned over of a virtual deck is red or black correctly, your winnings will be doubled. However, if you guess incorrectly, you lose all. You therefore have a 50% chance to double your winnings or a 50% chance to lose your winnings if you choose to play the game. Ladder Gamble – With the ladder choice, you are shown a selection of various values and a flickering light between all of them. To increase your winnings, you must stop the light on the value that is higher than your winnings at that time. Everyone enjoys a fantasy, and this game offers a fantasy to beat them all. It is by all means worth playing due to its magnificently artistic and animated symbols on its reels. Its familiar slot game features such as wilds, scatters, free spins and gamble games make it a game that is easy to play and enjoy. 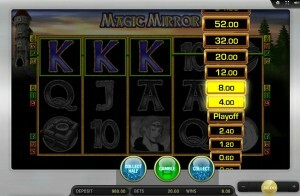 So join in the fun on SlotsClub.com and try the Merkur Magic Mirror game today!